The answer is yes. Cargo bikes in SF are orange. [More proof.] This bike seems to be permanently planted at 18th & Mission. I've never seen anyone riding it, so here's a friend of mine striking a pose with this lovely orange hauler! i was in Southern Mexico this past winter and these orange cargo bikes seem to be all over the place down there - used for street-side selling, bottle-collecting, family-transporting. Does anyone know how they make it to North America? The whole time I was down there I was envisioning myself in the slushy streets of Halifax, cruising with cargo. P.S. I saw a WHITE cargo bike at Rainbow Grocery this evening. I always thought that cargo bike looked lonely sitting there. I'm surprised it's survived so long at that spot without being cannibalized (knock on wood). HEY! I saw this at the Cargo Bike Gallery! Hi Gwadzilla, thanks for stopping by! Yes, this pic was in the Cargo Bike Gallery! This bike has been completely transformed and will be in operation in its new incarnation within a few weeks. Timothy is going to rock Dolores Park. @little green - does this bike belong to you? It's a beauty! A taco bike? I am so looking forward to following you! no, the bike belongs to Timothy at Weird Fish. He just brought it up to us in Santa Rosa, to transform it into his dream street food machine. My husband got all tricky with it and created the ultimate in safe food handling taco bike awesomeness. Well - Timothy's contribution to street food on wheels will be one to follow! I will be happy to see this moving around. 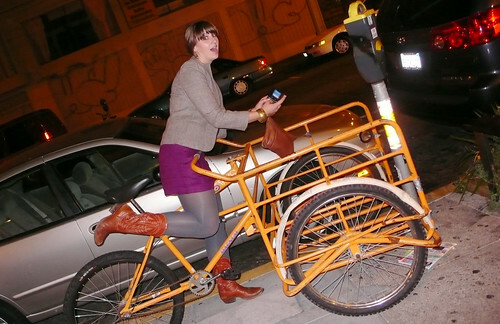 It's so coincidental that you wrote to us because I was just telling a friend who's doing a project on the use of cargo bikes about this "orange cargo bike that I always see parked at 18th & Mission." Now it's a blue cargo bike that will be serving tacos in Dolores! Yes, Timothy tacos are going to be a HUGE HIT!